World of Tanks’ 9.2 update has rolled out, shooting out new clan features, HD tank models to make the tank on tank warfare a wee bit prettier, and new versions of existing maps like Sacred Valley and Hidden Village. Wargaming says that the focus of these map changes are strategy and balance. A “newly imagined combat territory” has been thrown into the mix to boot: Fiery Salient, complete with raised train tracks and a snipers perch for those dastardly long-range killers. The biggest of the new features is undoubtedly Strongholds mode, a system particular to clans. Strongholds are virtual bases, claimed and built up by groups of players. Expanding the stronghold and constructing new buildings confers bonuses to the clan, but to get the resources needed for these big projects, clans will need to go head to head in clan battles, duking it out in the hopes of creating a better stronghold. Several tanks have also received a bit of a makeover. Most notably, the VK 45.02 has been overhauled quite a bit, with significant increases to its amour, boosting the upper and lower glacis to 200mm and the front turret to 60mm. 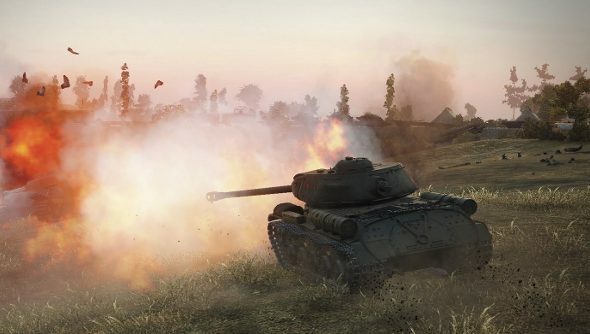 During the World Cup, I got back into World of Tanks thanks to the silly tank football mode, and I reckon I’ve got plenty of reasons to stick around.